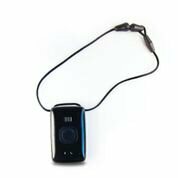 Belle® is a small, easy to use emergency pendant that offers you confidence to live life on your terms, and easily get help at home or away from home; anywhere in the US where there is AT&T 3G coverage. The rechargeable battery lasts up to 30 days per charge. A simple charging cradle makes recharging easy. Speaker - It’s easy to hear the specialist answer your call with this high quality speaker. Call Button - Just press one button to speak with a specialist and get help. It’s that simple. Battery Light - A small red battery light will notify you that Belle is fully charged or is ready to be charged. Call Light - After you press your call button, a small blue light will alert you that your call is being relayed to a specialist. Microphone - A powerful microphone will allow you to speak with a kind, courteous specialist. They can send emergency help or contact a loved one to assist you. Try Belle today and enjoy the freedom, security & confidence you deserve.